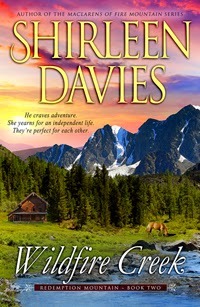 Now scheduling a Two Week Tour for Wildfire Creek by Shirleen Davies. This is a 90k word, Western Historical Romance Novel. This tour will consist of Interviews, Guest Posts and Q&As only. No Reviews. If you're interested, please email me with your available dates Jan 26th - Feb 6th. Luke Pelletier is settling into his new life as a rancher and occasional Pinkerton Agent, leaving his past as an ex-Confederate major and Texas Ranger far behind. He wants nothing more than to work the ranch, charm the ladies, and live a life of carefree bachelorhood. Ginny Sorensen has accepted her responsibility as the sole provider for herself and her younger sister. The desire to continue their journey to Oregon is crushed when the need for food and shelter keeps them in the growing frontier town of Splendor, Montana, forcing Ginny to accept work as a server in the local saloon. Luke has never met a woman as lovely and unspoiled as Ginny. He longs to know her, yet fears his wild ways and unsettled nature aren’t what she deserves. She’s a girl you marry, but that is nowhere in Luke’s plans. Complicating their tenuous friendship, a twist in circumstances forces Ginny closer to the man she most wants to avoid—the man who can destroy her dreams, and who’s captured her heart. Believing his bachelor status firm, Luke moves from danger to adventure, never dreaming each step he takes brings him closer to his true destiny and a life much different from what he imagines. Ginny froze, not recognizing the deep growl coming from behind her. She did as he asked, her heart pounding, wondering if someone had slipped by Hank to come in the front door. Slowly she turned, raising her eyes to meet those of the man holding a gun on her. Her breath caught at the sight of Luke, his face hard, his mouth in a thin line. She could see the instant recognition dawned. He lowered the gun in a quick motion and slammed it into the holster. She swallowed the hard lump in her throat and took in a shuttering breath, anger replacing the fear she’d felt. “You scared the daylights out of me,” she hissed and pulled the hat off her head, exposing soft brown wisps of hair which had escaped the loose bun. He held his ground, taking in the sight of her in men’s trousers, a too big shirt haphazardly tucked inside and held together by a wide leather belt. The coat he’d given her covered the ridiculous outfit. He let his gaze wander over her, his eyes softening at the same time his body tightened—a reaction he was powerless to control. “What?” His voice took on a hard edge as his eyes narrowed, signaling his disbelief. He took a step forward, then thought better of it, crossing his arms over his chest, planting his feet shoulder width apart. Frustration warred with the desire he felt toward her. This was not what he’d expected to come home to—Ginny living at the ranch. It slammed into him that he’d see her every day, obliged to be around her, and forced to fight his constant attraction toward her. His jaw hardened as he processed the implication of her new position. He didn’t like it. Not one bit. “We’ll see about that.” He turned and stormed from the room, walking into the study, slamming the door behind him.